Sushi in my book is edible art. While I think all cooking is an art form in itself, there's something remarkable about sushi. The way it is prepared, served and meant to be enjoyed slowly is ceremonious. It's the kind of food that instantly puts me in a good mood. While the term sushi is ambiguous and somewhat loosely used, for me it encompasses a certain flavor and taste and I take liberties with it. The caveat with this recipe was that it had to be paleo and Whole 30, which of course works for me. But while paleo is sometimes flexible with rice, Whole 30 is not and grains are strictly off the table. And traditional sushi is well, made with rice. But fear not as in comes cauliflower rice to the rescue. Also, if you're not whole 30, feel free to use regular sriracha but if you're strict, you can find Wildbrine sugar free sriracha. For rice: If you're not whole 30 or paleo, feel free to use regular rice. But otherwise, combine all ingredients under rice and set aside. It was an overcast October morning. A cold breeze was met by a sweaty palm as I paused to open the car door. I caught a glimpse of myself in the window, attempting without success to swallow the knot that had set up camp in my throat for the last 2 or so weeks. I looked like character from Clueless. According to my new step-sister, that was the appropriate outfit I needed to borrow for the very first day of my new American school. Looking back it was a bold move on her part. Everyone around me rocked tie-die, colorful t-shirts, jeans and sneakers, yet here I was, staring blankly at my chunky Mary Jane's fresh out of a Delia's catalog. I felt ridiculous with about 30 or so English words at my disposal and an anxiety that would take years to be tamed...still working on it. The details are blurry but what I recall is the opposite of what I anticipated. I'm sure there were plenty of comments exchanged, but the lack of language provided a shield of naïveté against them. Most kids attempted the friendly thing...I did too but there wasn't much to give as I just didn't have the words available. Smiling was all I had to work with. Lunch was intimidating, the food was intimidating as I wasn't familiar with the whole standing in line with trays process. A couple of girls who saw the look of confusion, helped me out through some clever sign language and I ended up with something manageable though completely new. A tuna hoagie, chocolate milk and a large chocolate chip cookie. And that was how I tried my very first bite of tuna salad. There was no question - the stuff was delicious. As the months wore on, I acclimated - made friends, wore plenty of tie die, grew to like my new small town and continued eating copious amounts of tuna salad. To this day, a can of tuna is a great lunch option, particularly when you're hungry and haven't planned well. I often make a big batch of tuna salad at the beginning of the week and have it on hand for lunches. Everyone likes it and minimal effort is required. 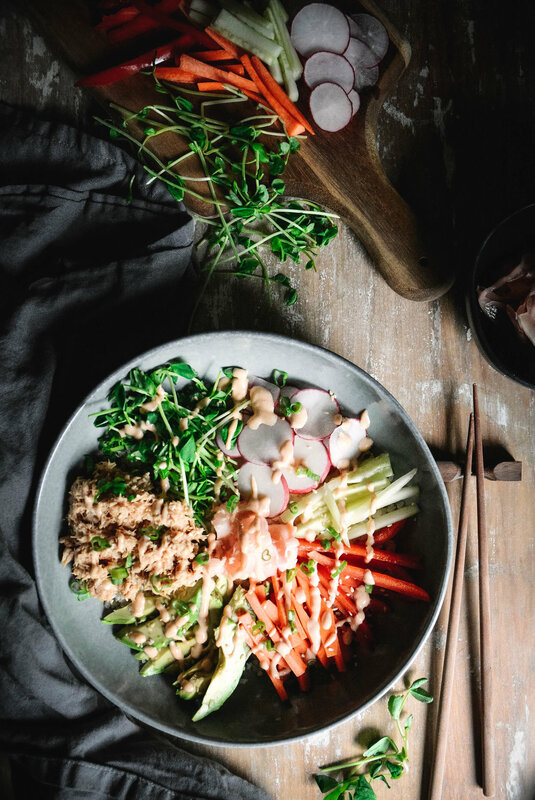 While making tuna salad is pretty basic, we often forget about the simplest things available to us in those hangry moments where we just want to stuff our faces with anything (not that I do that). All you need is roughly 10 minutes to whip up this tuna salad with apple and dill. I personally think tuna salad works well with avocado, tomatoes, any sort of greens, radishes, walnuts and pumpkin seeds but you can get creative and pair it with whatever you fancy. 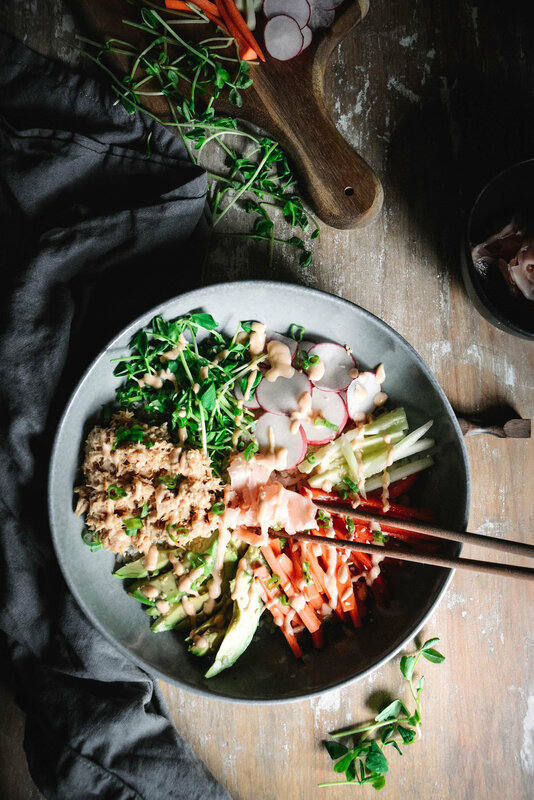 In medium bowl combine all ingredients under tuna salad and mix well with a fork, breaking up the tuna fish and combining all ingredients until fully incorporated. In smaller bowl mix all ingredients under lemon vinaigrette and whisk until thick. To assemble, layer a handful of greens on plate, add tuna salad and if you wish, any other toppings. Drizzle with dressing.